Gert Heyns and Arno du Toit overcame an early mechanical to take the honours on the opening stage of the Liberty Winelands Encounter in the Cape Winelands today. Presented by STANLIB, the first day of the three-stage race saw the field tackle a 49km stretch from Zorgvliet Wine Estate just outside Stellenbosch to Le Franschhoek Hotel in Franschhoek. After an exciting day’s racing in which the lead changed hands at least once, Heyns and Du Toit crossed the line in 1:52:16, just under two minutes ahead of ASG-NAD’s HB Kruger and Matt Beers. Imbuko-Momsen’s Dylan Rebello and Marco Joubert raced to a close-fought third place, three seconds behind Kruger and Beers. It was however not all plain sailing for the DSV Pro Cycling pair as Du Toit, a Capetonian, hit the wall in the closing kilometres and had to be nursed home by his teammate. An early attack by Beers animated the stage but the eventual winners were able to stick with them until Du Toit, who won the marathon title at the African Continental MTB Champs in Mauritius last year, had trouble with his rear derailleur. Meanwhile, as they were chasing back, Kruger took a wrong turn up front, which levelled the playing field at the sharp end of the field. Heyns, a Stellenbosch local who impressed with a fourth-place finish in the Cape Town Cycle Tour MTB Challenge amid a strong international field in March, and Du Toit wiped out the deficit without too much trouble. Once they hit the front there were no further challenges from their opponents. “We are both quite good technical riders so we kept riding smoothly and tried to go hard on the single-track,” said Du Toit, who found the route relatively smooth. He said Heyns’s knowledge of the conditions played an important role. 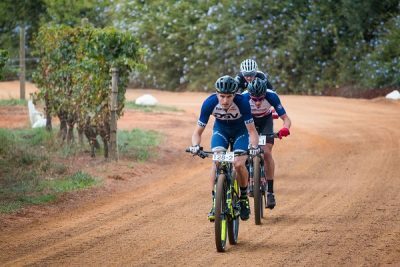 Although he raced in the SA MTB Cup Series event in Pretoria earlier this month, Du Toit admitted it was the first real intensity he had faced since the Cape Epic last month. “I was pretty much in the hurt box most of the day, but I am sure tomorrow will be better. I don’t think we will ride defensively and will try to keep attacking. The mixed category was won by Home Ice Cream-Dormakaba’s Matthew Stamatis and Samantha Sanders, who held off The Gear Change’s David George and Katie Lennard. Louise Ferreira and Marleen Lourens were in a class of their own in the women’s section. Tomorrow’s stage features a 48km loop from Le Franschhoek Hotel and back.